Who lead the Umbrella Movement? There have been many suggestions that the Umbrella Movement was, in fact, a leaderless protest. To an extent that was the case, however, a more holistic approach to the understanding of leadership would argue that although there were no pre-designated leaders, it is clear that leaders arose from the crowds during the 79 days. A leader, particularly in the context of the Umbrella Movement, was effectively any person that could yield influence in Hong Kong. Initially, the Occupy Central with Love and Peace group tried to use marshals to manage the protesters, however, this clearly failed as OCLP was effectively sidelined after the first few weeks. The speakers on the main stage in Admiralty were only as effective as the counter-voices among the crowds below hence it is not possible to directly pinpoint the leaders of the Umbrella Movement. It is easy for the anti-Occupy and pro-China movement to label the HKFS, Scholarism and OCLP as the leaders as they want to scapegoat someone for the current situation that Hong Kong is now facing, however, closer inspection shows that the question of leadership in the Umbrella Movement should rather be one of who and to what extent a person is of influence. Music plays an important role in society and culture with the Umbrella Movement being no exception. Music and visual arts were a prominent aspect of the Umbrella Movement both as an instrument of unity and a weapon of attack. Music is a key part of storytelling and, in my opinion, was used in the Umbrella Movement as a tool to frame the narrative of a peaceful people’s struggle against a ruling authority. The presence of several semi-well known musicians at the protests along with the singing at night created an atmosphere that was inviting to others further giving the impression that the protests were a people’s struggle. Pro-democracy protesters often sang Happy Birthday to anti-Occupy protesters in trying to diffuse the situation. I did not personally witness any altercations between Umbrella and anti-Occupy protesters however the Happy Birthday song was used as a meme in trying to ridicule the anti-Occupy movement. At the end of the day, music and the arts are part of the grander scheme were the loudest tune will be heard whilst others regardless of its intent or message will be drowned out. 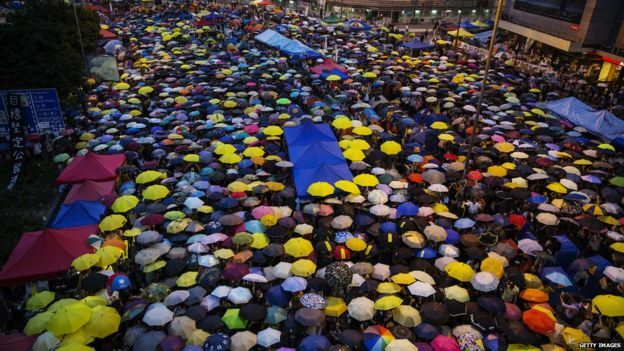 The Umbrella Movement was a question of leadership both in the protests and at the wider level about the governance of Hong Kong.